An old electrophoretic technique called dielectrophoresis has been recently developed further to enable cheap label-free separation of cell populations that could eventually be adoptable to a Good Manufacturing Practices (GMP) environment. Dielectrophoresis exploits the different degrees of polarizability of particles with different properties when placed in a variable electric field, whereby the particles form dipoles of different magnitude and polarity and thus sort themselves accordingly. In a population of cells that differ in terms of physiological state, the different types of cells will possess different electrical properties, such as resistance and capacitance, and in turn these differences are expected to provide the basis for separation under dielectrophoresis. 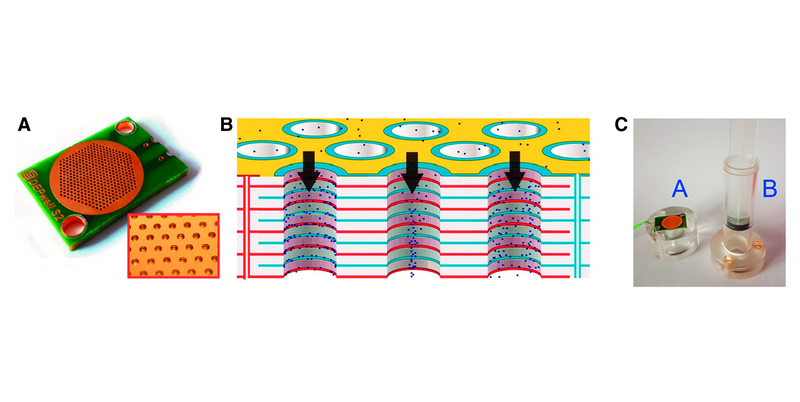 The team developed this old technique for use in cell separations by the invention of specific 3D multilayer laminate electrodes that were ultimately assembled into a plastic chip and a simple separation device (Figure 1). 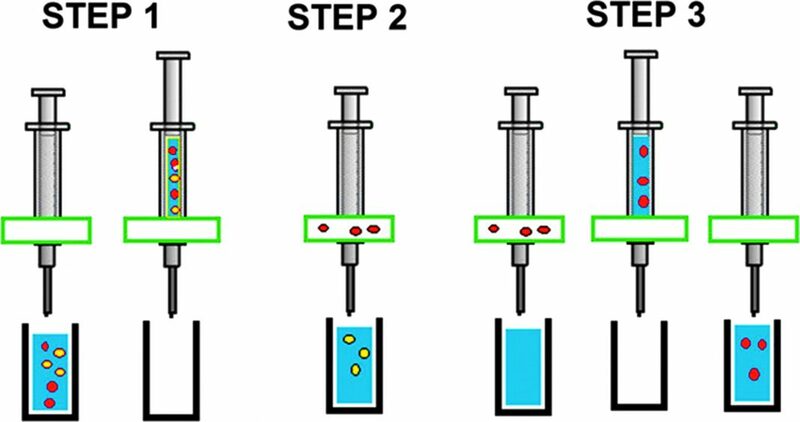 The use of a three-step loading/separation/elution procedure allowed the collection of each of two populations of cells (Figure 2). A good performance in terms of cell population purity and recovery was noted for these prototype devices. It is expected that this new approach to cell separation, given its simplicity and lack of use of fluorescent and other reagents, will be utilized in multiple settings, including for manufacturing of large batches of cells in regenerative medicine settings. Figure 1. (A) Photograph of the DEP separation chip. The chip size is 30 mm × 20 mm. (Inset) Red section shows a close-up of the chip, showing the electrodes along the inside of the wells. The section of the chip in the image is ∼5 mm square. (B) Schematic of the chip, showing the three modes of DEP behavior. Cells flow from top to bottom through the wells; in the left well, cells can be seen experiencing positive DEP, are attracted to the electrodes, and held; in the center well, cells experience negative DEP, are repelled into the center of the well, and pass through. In the third well, cells experience no DEP force. In reality, cells of the same type will experience the same mode of behavior in all wells on the chip, but two different cell populations can exhibit behaviors different from each other. If one subpopulation experiences positive DEP and the others exhibit negative or neutral behavior, they can be separated. (C) The chip is loaded into a fluidic cartridge comprising two parts; an upper part B contains both housing and plunger, whereas a lower part A collects the cell solution. The chip fits between the two, sealed on both sides by O rings, and is clamped together by three Allen bolts. Currently, cell separation occurs almost exclusively by density gradient methods and by fluorescence- and magnetic-activated cell sorting (FACS/MACS). These variously suffer from lack of specificity, high cell loss, use of labels, and high capital/operating cost. We present a dielectrophoresis (DEP)-based cell-separation method, using 3D electrodes on a low-cost disposable chip; one cell type is allowed to pass through the chip whereas the other is retained and subsequently recovered. The method advances usability and throughput of DEP separation by orders of magnitude in throughput, efficiency, purity, recovery (cells arriving in the correct output fraction), cell losses (those which are unaccounted for at the end of the separation), and cost. The system was evaluated using three example separations: live and dead yeast; human cancer cells/red blood cells; and rodent fibroblasts/red blood cells. A single-pass protocol can enrich cells with cell recovery of up to 91.3% at over 300,000 cells per second with >3% cell loss. A two-pass protocol can process 300,000,000 cells in under 30 min, with cell recovery of up to 96.4% and cell losses below 5%, an effective processing rate >160,000 cells per second. A three-step protocol is shown to be effective for removal of 99.1% of RBCs spiked with 1% cancer cells while maintaining a processing rate of ∼170,000 cells per second. Furthermore, the self-contained and low-cost nature of the separator device means that it has potential application in low contamination applications such as cell therapies, where good manufacturing practice compatibility is of paramount importance. ASSAY & Drug Development Technologies, published by Mary Ann Liebert, Inc., offers a unique combination of original research and reports on the techniques and tools being used in cutting-edge drug development. The journal includes a "Literature Search and Review" column that identifies published papers of note and discusses their importance. GEN presents here one article that was analyzed in the "Literature Search and Review" column, published in Proceedings of the National Academy of Sciences titled "High-throughput, low-loss, low-cost, and label-free cell separation using electrophysiology-activated cell enrichment", authors are Faraghat SA, Hoettges KF, Steinbach MK, van der Veen DR, Brackenbury WJ, Henslee EA, Labeed FH, Hughes MP.